Audio players have more and more functions each day, on many occasions thanks to the plug-ins that can be included, that sometimes allow us to install new visualization modes or view the lyrics of any song that is playing. 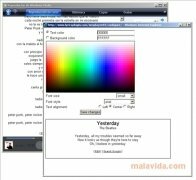 Lyrics for Windows Media Player, also known as Lyrics WPM, is a small plug-in that allows you to view the lyrics of the songs while they are played, instead of showing us the graphic or parametric equalizer. The program recognizes the song by means of the ID3 tag and searches in its database to see if its lyrics have been input, so it will be necessary to have an Internet connection for it to work properly. This can be ideal to practice the songs before going to the Karaoke with your friends, improving our English by means of music or to understand what many singers say during their songs. If you want the lyrics of all the songs that you can listen to thanks to WMP, all you have to do is download and install Lyrics for Windows Media Player. This download requires an Internet connection to obtain the lyrics of the songs.